Part of the fun of being a foodie is recording your adventures in both word and still life. I’ve seen many a food blogger whip our their camera (ps – do ALL food bloggers have the Canon Rebel or what?) and angle for the best possible shot of the meal they’re about to enjoy. But I know a lot of us don’t know many tricks and tools beyond the macros setting. Jennifer Winter is joining us as a guest blogger today to give everyone some tips on taking beautiful food photographs. I am the person you see in the newest DC hotspot, subtly revealing their camera in the hopes to capture (and do justice to) each of the plates presented from the kitchen. I am a foodie photographer. I appreciate picturesque landscapes, candid moments and stunning sunsets, but there is nothing like capturing the creativity, the colors, textures and overall presentation of an inventive Chef. However, it can be intimidating to brandish a camera in a dimly lit room where people are striving to maintain their own private spaces and then ruin it with a bright flash. I’ve been on the receiving end of judge mental looks of fellow patrons – its just not comfortable. The good news is there are ways to get the shots you want, without bringing too much attention to yourself and you don’t necessarily need a professional SLR to do it. I have two cameras that I use for food photography and to be honest, I decide which one I am going to carry based on the size of my purse (I know, I know). The first is a basic Canon SD800 IS point and shoot and the other camera is a Canon Rebel XTi. No matter which size camera you use, as long as you keep in mind a few technical pointers you can achieve great food images. 1) Make sure to set your white balance appropriately. Most cameras have an auto function for on-the-go circumstances, but if you have time and have the functionality on your camera use the custom option. This will ensure that you have the most accurate measurement of color temperature for the current light conditions and you will be happier with the overall results of the image. One of the best parts about travel – especially travel that involves drinking and dining well – is coming back and sharing what you found with friends. Stories of amazing meals and beautiful sights, photos that capture it all in vivid color…it’s like reliving the trip. But the real joy comes in sharing the goodies you bring back with you. After a recent trip to Belgium, our friends Itty Bitty Betty and the Bacon Terrorist offered us plenty of all three. We asked I.B.B. to share with you, too. Sorry…we finished all the beer. While we all reap the benefits of D.C.’s growing love affair with Belgian beer, actually visiting Belgium last year gave me new appreciation for my favorite decadent, boozy brews. I am lucky that my boyfriend, the Bacon Terrorist, and I share a fascination with triples, doubles, lambics, and all of their delectable contemporaries. After talking about going to Belgium for years to enjoy them in their natural habitat, I was thrilled when we finally booked the trip. Arriving in Brussels, our mission was simple: seek and imbibe every beer we had never seen in the States, and if we knocked back a few old favorites along the way, even better. This was actually harder than it sounds. 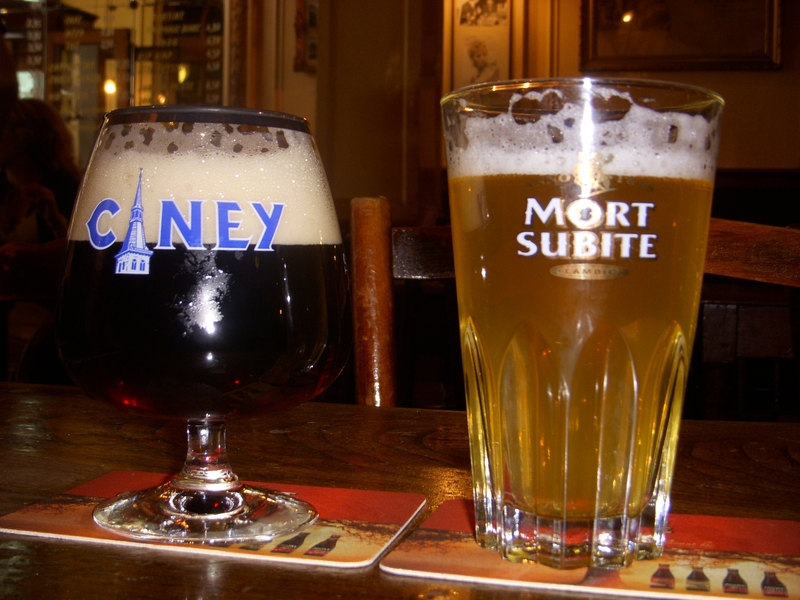 While we think of Belgium as a brewtopia, where every bar contains magical brews you’ve never heard of before, most bars carry a similar selection of drafts (e.g. Leffe, Stella Artois, and Maes Pils – think Belgian Heineken). Still, we didn’t have to go too far off the beaten path to find unique bars with local brews that don’t frequently journey over the Atlantic. 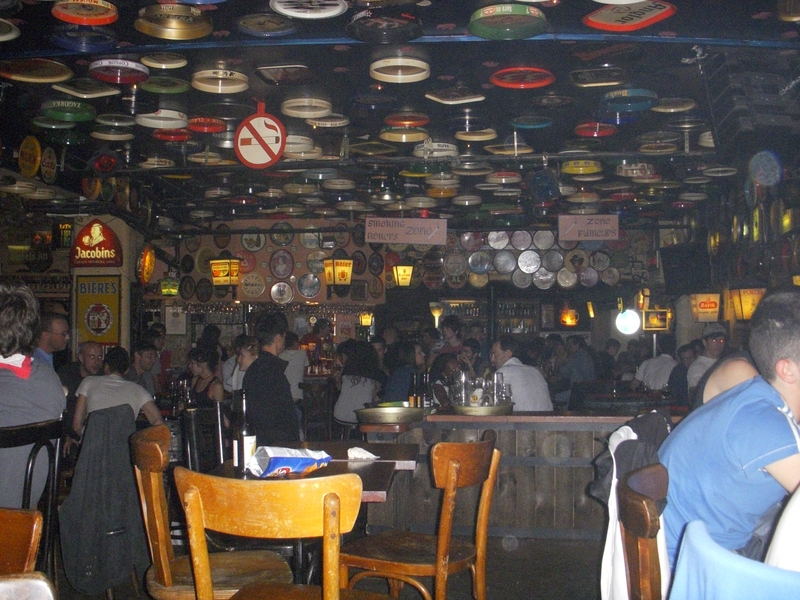 Another bar worth grabbing a drink (or four) in is Delirium Café, which offers a full draft selection of the entire Huyghe catalogue, and a rowdy dive-bar atmosphere. The Cantillon brewery is another fun stop in the neighborhood, complete with self-guided tour and a tasty pour of lambics at the end. Other standout beers were Ciney Brown, Mort Subite (“the sudden death”), and Grottenbier, a modern version of a Belgian “Grotto” or “cave” beer. [picture of ciney brown and mort subit in glasses] We also procured a few bottles of the infamous Westvleteren, a beer so famous it requires no label, and a favorite of beer snobs worldwide. We brought a bottle of all three styles (Blonde, 8, and 12) home to share with good friends, including some of our favorite drinking buddies, Mike and Elizabeth. We didn’t think Westvleteren fully lived up to the hype (for some, Westvleteren is akin to the holy grail), but they were definitely delicious. 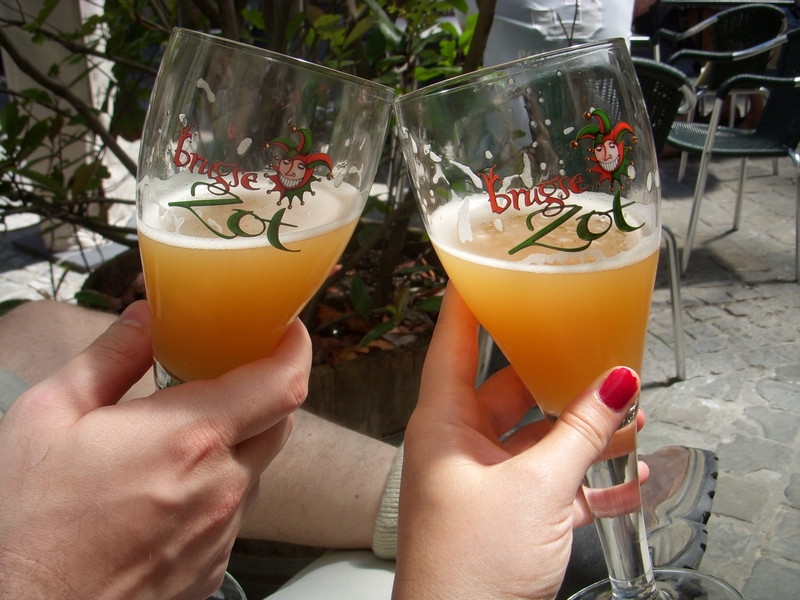 While Brussels is a necessary stop on any beer lover’s journey, a day trip to Bruges was our favorite part of the trip (only an hour by train, and $48 round trip—a steal considering Bruges is one of the most breathtaking places we’ve ever seen). The Brugse Zot brewery was one of the more memorable stops on our tour de beer. Sure, it’s a standard tourist stop, but sometimes you should follow the wisdom of the crowds. This small operation is the only active brewery in Bruges, and you can view the entire city from its rooftop. After a tour around the facilities, you are rewarded with a hearty pour of the Brugse Zot Blonde, and a seat in the romantic garden outside the brewery. The temperature the day we visited was 92° F, so the refreshing coriander and orange finish of this beer was a welcome treat. Overall, the trip reminded us that while Blue Moon tastes better than Bud, at the end of the day it really can’t compare to a freshly poured glass of Sterkens White, or a Cantillon Gueuze straight from the brewer’s hands. Travel Tuesday: Hungry for Hungary? Every relationship has celebrated milestones. Like getting brunch together after dancing it up at 80s night, few things cement the “this is getting serious” step like the first trip away together. Most couples choose a sunny, romantic destination. Mike and I? We went to Hungary. In October. Okay so maybe Budapest isn’t everyone’s first idea of a romantic city but whatever. Mike and I are goofy like that. Our visit wasn’t driven by culinary travel, but we ended up having some of our favorite food-related experiences during the trip. 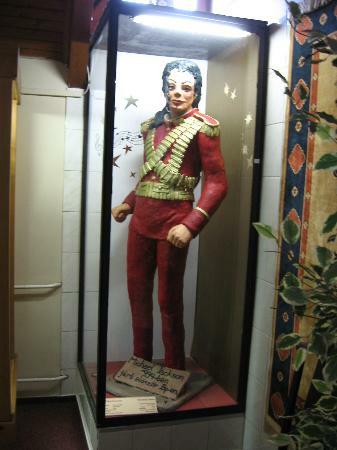 Who would have guessed a tiny eastern European country could deliver a six-foot tall Michael Jackson statue made out of white chocolate? Or a wine destination with what might be the best Wine Goggled name on the planet? Gerbaud – Thanks in part to its downriver Danube proximity to Vienna, Budapest has a striking coffee and pastry culture often celebrated in soaring salons fit for Marie Antoinette. 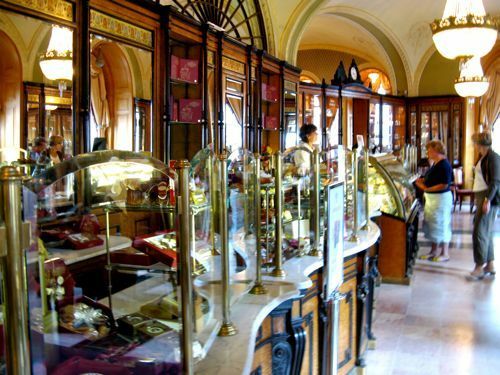 Open since 1858, Gerbaud is the grande dame of Budapest salons. The light-filled salon was painstakingly restored in 1997 to look regally ancient. Gleaming floors lead our eyes up to a brillaint counterop filled with sugary delights. Taking a seat in the salon, we sat back as brisk waitresses flitted between tiny cafe tables with trays of pastel colored goodies and strong coffee. It was the perfect way to fight off jet lagg and ease into our vacation. Szabo Marzipan Museum – A little way down the Danube from Budapest is a village known as Szentendre. This little village might be in guide books recommending a scenic getaway into an artists village, a chance to stroll through a small Hungarian community and take in tiny shops and ancient churches. All of these things are true but they don’t shout the town’s biggest feature from the rooftops: The Szabo Marzipan Museum. Could it be true? An entire museum with all of its displays intricately carved from almond paste? So true and so bizarre. Especially considering the chosen topics – countless classic Disney characters vied for attention next to Hungarian landmarks. But the creme de la marzipan had to be the borderline creepy Michael Jackson. Standing at life-size attention and captured during the King of Pop’s miltary-esque costume phase ,the piece is just strange. Deliciously strange. French Twist DC wants to get you ready for Macaroon Day. Sign of the Whale, one of the key locations in the Connecticut Ave Herpes Triangle, has moved to Connecticut Ave and the Madhatter has re-opened with new management. My 22-year old self is glad to have this info. My present day Twirtysomething self wonders if anyone who reads a DC food blog would go to either of those places. DCist gives us the buzz (ha!) about the White house beekeeper and tosses in a shout out for urban bee keeping in the process. Againn is opening a second location in Rockville. Interested in an organic wine tasting? Did you know there is a Ryan Adams-themed pizza joint in North Carolina? Not to be outdone by my recent whining about Mexican food in DC, one brave DCist soul tries a bunch of taquerias in search of DC’s best taco. The suggestions in the comments section are worth a visit. What is the first sign of spring in the city? Dining al fresco. Best Documentary Oscar winners created a sting operation on Hump, a restaurant in Santa Monica found to be serving whale. This year’s Arlington Reads program focuses on sustainable food. 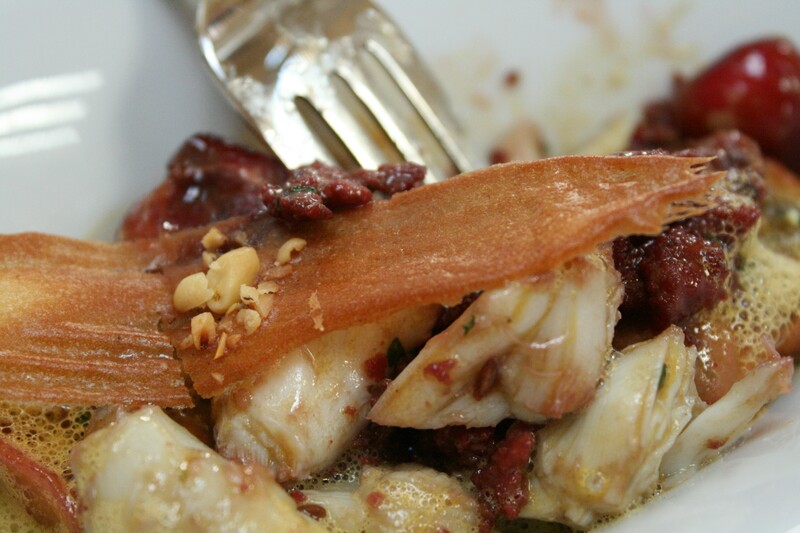 Jane Black spills the beans on underground (and we don’t mean in the metro) dining in DC. DC Wrapped Dates gives a thorough review of Four Sisters. K Street Kate reports Serendipity 3 will open in the old Nathan’s location in Georgetown. Get the butter, ya’ll! Paula Deen’s sons are launching a food magazine for men. I’m all for another food magazine in the marketplace but suggesting that men have a different way of cooking strikes me as BS. 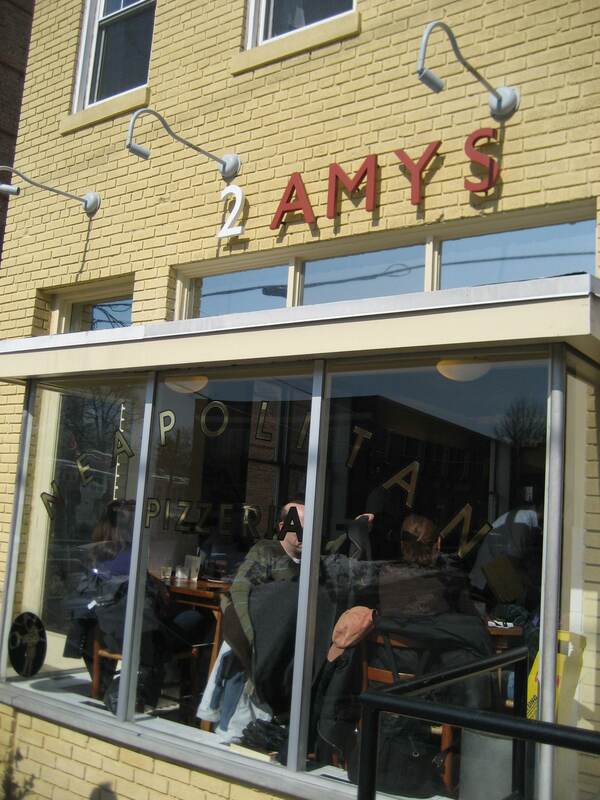 Okay, yes, finally we are reviewing 2 Amy’s Pizza. A DC favorite. A consistent #1 on many a pizza lover’s long lists of DC’s best. Should we issue anything less than a choir of angels trumpeting the awesomeness of 2 Amy’s, I fear we’ll have to outrun an angry pizza mob armed with torches, rotten tomatoes, and sloshing buckets of molten mozzarella. All of which has added up to making me ambivalent. Maybe I won’t like it. 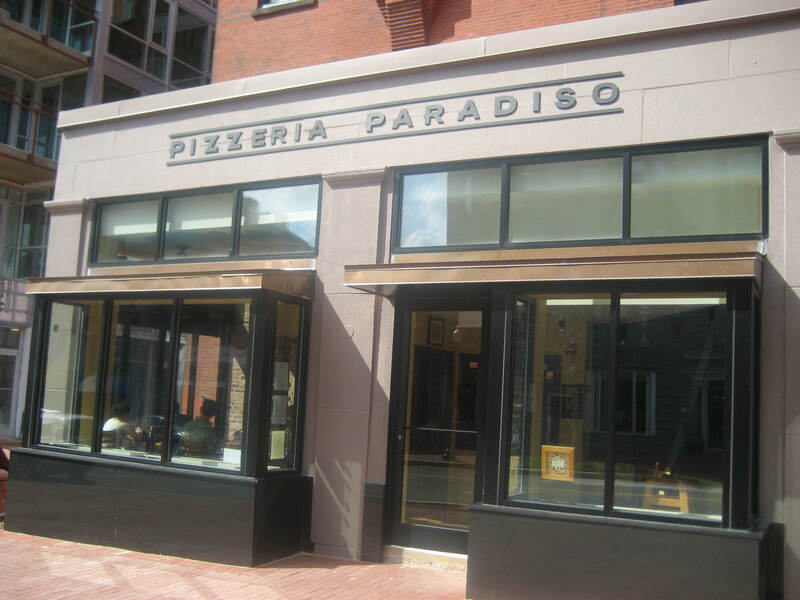 There are plenty of other great pizza options in DC like Piola or Pizzeria Paradiso. Maybe I don’t want to go along with the crowd, gawd. Plus, 2 Amy’s is like, so far awaaaaay and there is always a liiiiiiine. My hunger for a cripsy, cheesy pizza finally outwrestled my contrariness and we met up with our friends Jason and Amy and their adorable towheaded kids one Sunday morning. Although we showed up just a few minutes after the restaurant opened, we were told the wait was already up to 45 minutes. We bellied up to the bar in the meantime, biding our time in the raucous dining room until a table opened up.